I hope everyone had a nice holiday weekend. I thought I would share with you the Easter gifts we gave to different family members. 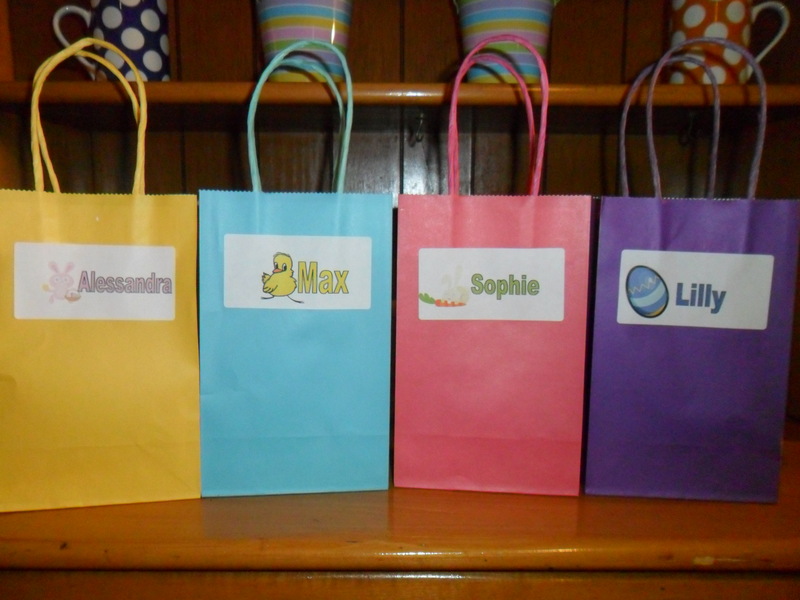 Here are the bags I made for my nieces and nephew. I don’t know why I took the picture before I added tissue paper and ribbon! Olivia gave a little present to her Mom-Mom, my mother-in-law. 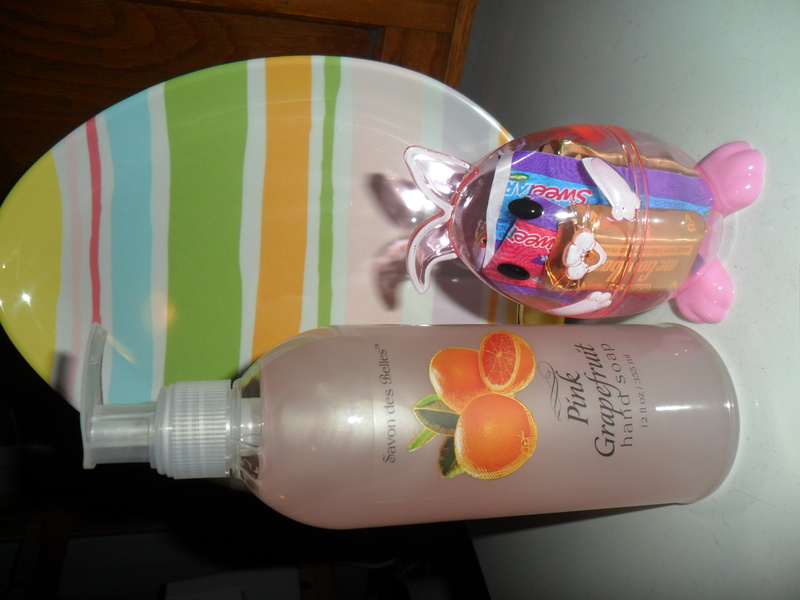 We filled a pink bunny egg with candy and pink grapefruit hand soap to match her pink bathroom. We wrapped it in one of my sister’s handmade gift bags. I try to use her fabric gift bags as much as possible because they are 1.) just as pretty as paper bags 2.) better for the environment 3.) reusable by the recipient. For our holiday weekend, we visited Olivia’s aunts. 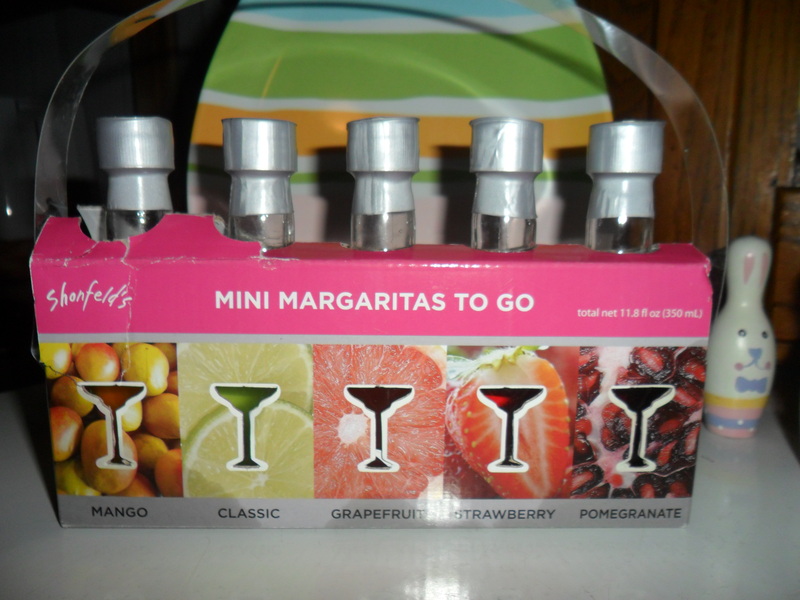 I used this pack of mini-margaritas-to-go and tiny tequila bottles to make grown-up Easter bags for the hostesses. 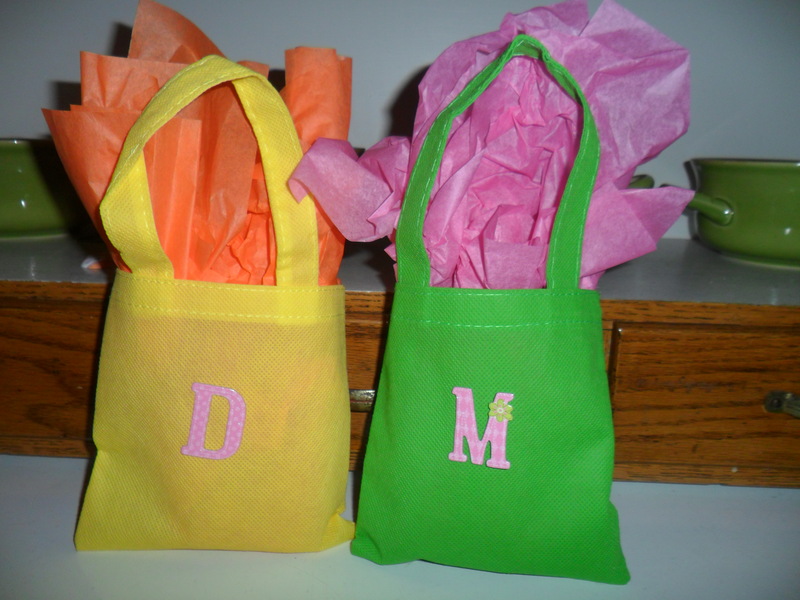 I added colorful tissue paper and used stickers to monogram the bags. 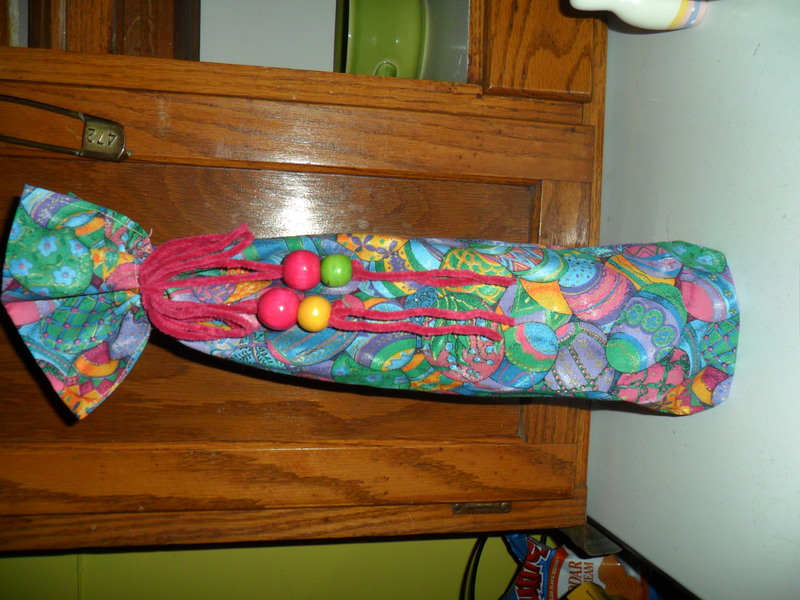 A bottle of wine is always a great gift to bring, again using a fabric gift bag. This one has Easter eggs on it. We also got this cute watering can from Target for my niece. 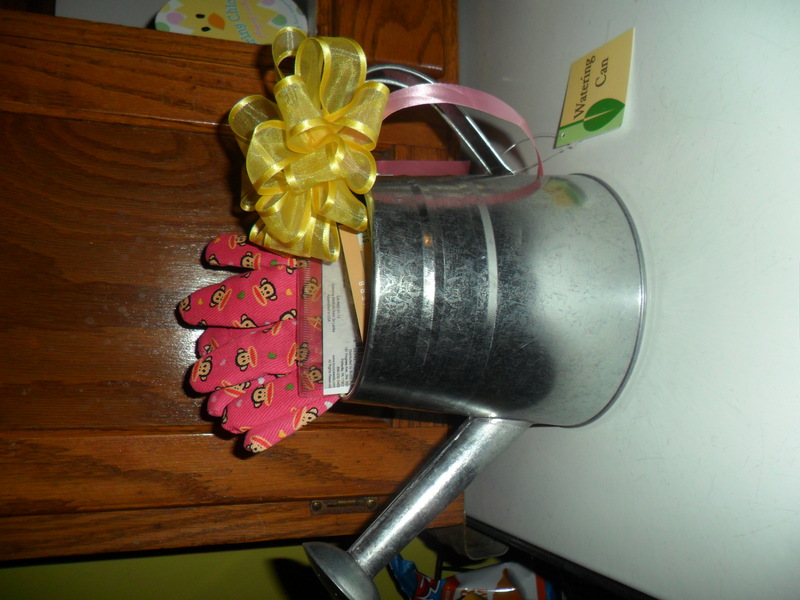 We tucked gardening gloves and some seeds in the can so she can plant some flowers in her garden. She actually used this gift in the garden this weekend! I also bought this cute gift bag for the “Easter Bunny” to fill for Olivia, I think I am going to save it to reuse each Easter. I hope everyone had a great weekend. I was away with no computers or phones – it was great! Did you give or receive any gifts? Tell me how your weekend was. The comments have been slow lately – and I have no idea why, since I have a FABULOUS prize just waiting with your name on it! Cute.. Cute. Cute. 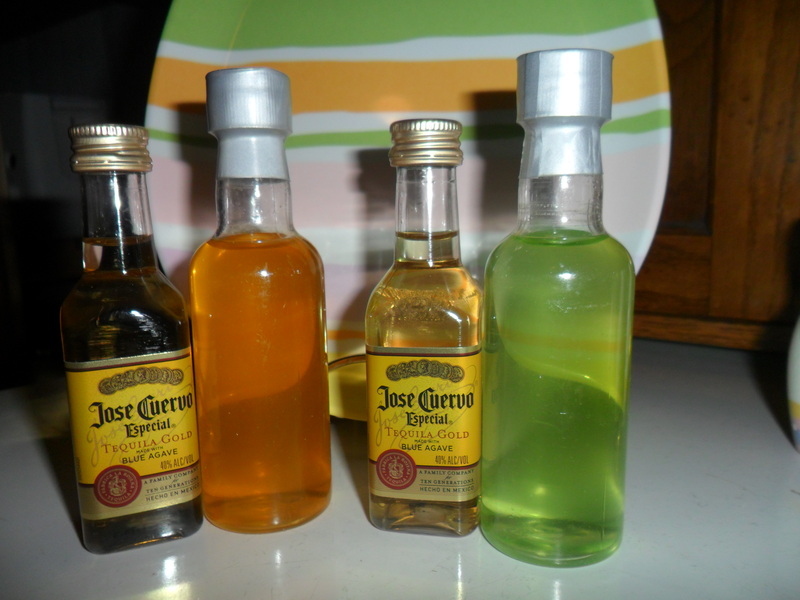 I LOVE the mini margaritas to go with the tequila nip! I am definitely going to use that one. They would be fun tucked into a margarita glass too! Happy Easter! Thanks Nina – and CONGRATULATIONS! You are my 100th comment! Since I already have your contact info — just look out in the mail for a prize from My Color Coded Life!!!!! Yay! That is exciting. Thank you! Those handmade bags are adorable! Does your sister sell them? Thanks for the comment Rachel … you were 101 … so close! If you are interested in purchasing a bag – I do have some that I sell (usually at work too – so I can bring some next time you may be around.) 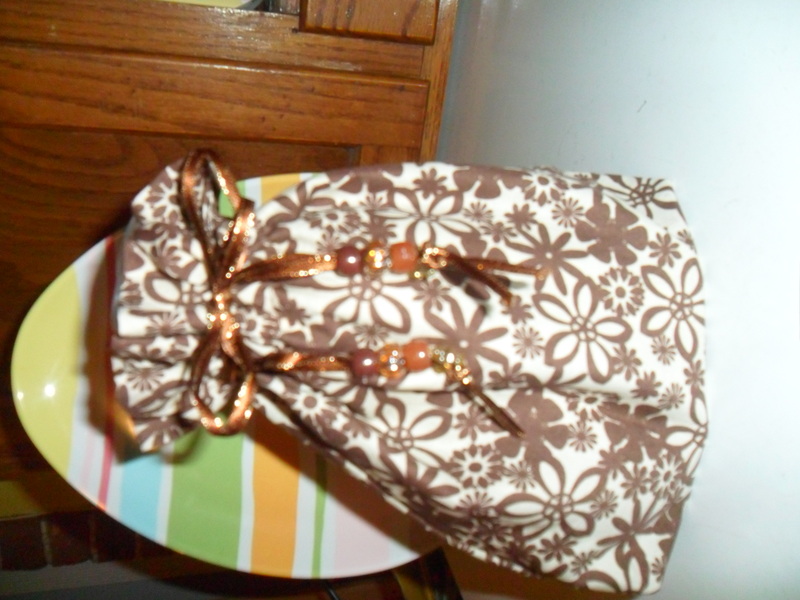 Small Gift Bags are $3 , medium $4, large or the wine bag $5. I can also make a greeting card to match if you are interested. The next batch I will most likely be selling will be Mother’s Day. But I can also do generic, thank you, happy birthday. 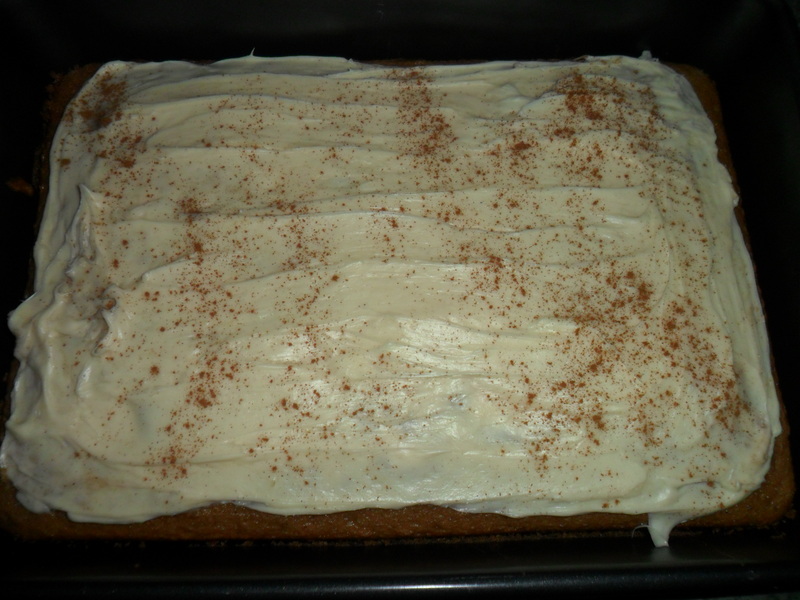 and needless to say, I love that spice cake! I have lots of gift bags for you to choose from! You are so creative. And thoughtful! Every year, Joe and I help the girls ( now just Lainie) dye Easter eggs the day before the holiday. The morning of, we have an egg hunt already set up for Lainie. She loves it. Joe leaves out a plate with a half eaten carrot, like how we leave cookies for Santa. After the egg hunt, Lainie looks at the basket her grnadmom made and the small gifts we get her. I don’t do candy, since my mom does, so this year we got Lainie some cool bubble stuff and suction cup paddles-so she can play outside. Also every year, we go to my cousin Kristi’s in Erial, NJ. We are always in charge of dessert. Normally we do cannolli but this year we did a tray of chips and dip-the chips are really a cannolli shell in the shape of a chip and the dips are the different fillings you would get in a regular cannoli. There is always an egg hunt in Kristi’s huge backyard and in the eggs instead of candy was money. Change, half dollars, even a few dollars, the kids were thrilled. Spending time with family is great. I’m sorry I just replying to this. I always want to reply and then time runs away from me.